Spend a relaxing weekend taking in the fresh country air. Sooth and replenish your body with fantastic, nutritious food during a relaxation retreat that teaches you the art of vegetarian cooking and the benefits of yoga. Take part in relaxed, fun and informative vegetarian cooking classes led by vegetarian chef Manigriva dasa. 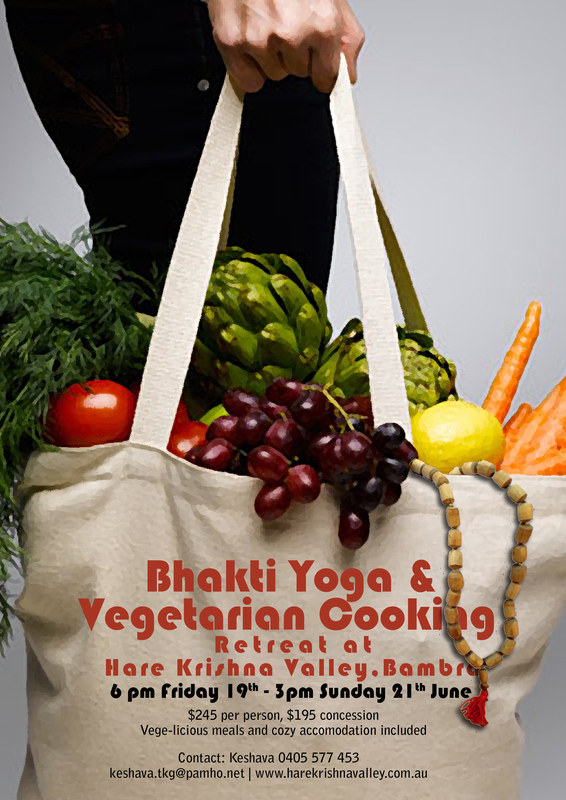 The classes will teach you how to balance meals and prepare great vegetarian dishes from around the world. From bread making to sauces and flavouring methods, this course will provide you with inspiration and ideas that are easily achievable in your own kitchen through simple and fun recipes. You'll also collect produce for each meal from the organic vegie patch on the property. Classes include information on the nutritional and healing properties of herbs and spices, elaborate tuition on nutrition, and shopping hints. During your stay you will enjoy 2 vegetarian banquets which you will have a hand in creating! Take time away from the hassles of daily life to focus on your own physical and emotional health. Set in the foothills of the Otways Ranges, the retreat centre is an ideal place to spend a weekend eating delicious food, meeting others and focusing on your wellbeing. During your two day and two night stay, you will experience the physical and mental health benefits of yoga, with yoga classes lead by yoga instructor Ari Engelman. You will have an introduction to bhakti yoga and kirtan and attend morning yoga classes, and when you're not attending cooking classes and enjoying delicious vegetarian meals, you'll also have time to stroll in the surrounding State forest. The cost for the weekend retreat is $245 per person or $195 concession. The cost includes; all your meals from Friday night to Sunday lunch (including 2 vegetarian banquets), tuition on nutrition and Ayurveda principles, cooking classes, yoga classes and 2 nights accommodation in twin share rooms.